Well, Spring Break is finally here! We are spending the week in Tacoma with the Petersons. Yesterday Gracie got a tricycle from Grandma and Grandpa Peterson for an early easter present. Here she is in action on the new tricycle! We are having a great time and getting in some visiting as well as some relaxation. 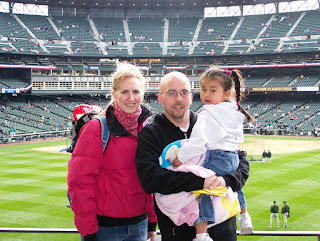 Tonight we will hit a Mariners game and tomorrow we will head back to Sea-Town for some sight-seeing. Tuesday night we bundled up and headed off to Safeco Field to see the Mariners in their 2nd game of the season Vs. the Oakland A's. We had a great time and the M's played a great game with lots of offense and won 8-4. We had a great time and enjoyed the stadium as much as the game. Wednesday we headed back into Seattle for some additional sight-seeing. We started out by parking in Downtown Seattle and then walking down Pike St. to Pike's Market and then down the stairs to the waterfront. We visited the Seattle Aquarium and ate lunch at Ivars. Gracie had a blast seeing all the sea life and touching some of them too. After the aquarium, we walked down a few piers to Ivar's Fish and Chips and got lunch. We fed the seagulls, which is always a lot of fun too. Those gulls have to have the highest cholesterol count of any seagulls in the area. They are quick, agile, and willing to do anything for a french fry! After lunch, we walked back up to the Westlake Shopping Center and caught the monorail for a ride to the Seattle Center. We then took a trip up in the Space Needle. Gracie had a blast and remembered that the Little Einsteins looked for Annie's Birthday Balloon in Seattle. She also loved using the telescopes and binoculars to look around the Puget Sound and Seattle. After all of that, we hopped back on the monorail and went back into Downtown Seattle for a little shopping. Gracie napped while we shopped around. A couple hours later we were all exhausted and ready to head back to the Petersons' for a rest! Pictures can be found on the Picasa Gallery. We spent Thursday relaxing and then went down to the waterfront at Ruston Way. We went for a walk and Gracie got to ride her new tricycle until she was too tired to pedal. We had lunch and enjoyed the spring sunshine. Later that night we attended a musical that featured our cousin, Christian Duhamel as Vinnie in "Once Upon A Time In New Jersey." We had a great time and were so impressed with CMD's talents! April 6. AFM's Birthday. We spent the day shopping at the South Center Shopping district in Tukwila and ended the day with a great birthday celebration at the Rowe's. We had a great time and a truly blessed day together. The return to North Idaho is much easier now that there are a handful of Starbucks along the way.